This Cranberry Swiss Chicken is a fast and delicious dinner. One of the best parts was that the leftovers were even better. The original recipe called for using mozzarella cheese, but to me that would have been a bit flavorless. I opted instead for Swiss. If you don't have any white wine on hand, you can substitute chicken broth. I found that the wine gave a lot of great flavor so I try to use it if at all possible. Enjoy! Preheat oven to 350 degrees F (175 degrees C). Prepare a glass baking dish by spraying with cooking spray. Place chicken breasts into baking dish and sprinkle with cheese. Stir together chicken soup and wine; pour over chicken. 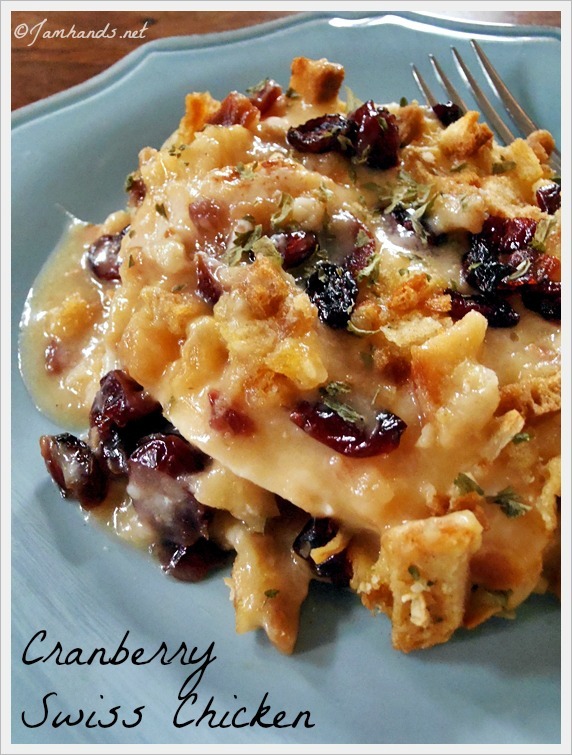 Sprinkle chicken with stuffing mix and cranberries; drizzle butter over top. Bake in preheated oven until chicken has reached an internal temperature of 160 degrees F (70 degrees C), about 45 minutes. I would recommend covering with foil for half of the baking time. Adapted from Allrecipes. Sharing this recipe at the following fun link parties. Yummy! I'm pinning this and will make it too. Thank you for sharing. for the stuffing mix. Can you just use stove top? Yes! I used a stovetop chicken stuffing and it was very tasty. This looks wonderful. I love the contrast of sweet cranberries and tangy swiss. Thanks for sharing at Simple Supper Tuesday. I made this last night. 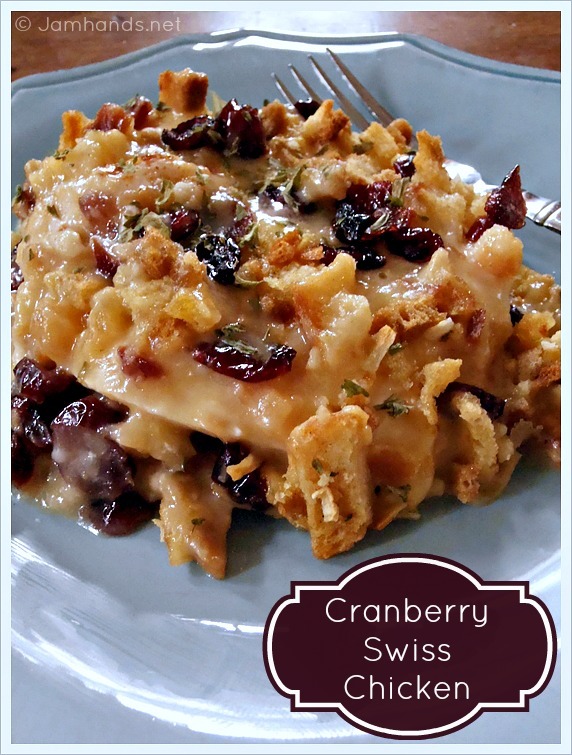 It was really good, I substituted white cheddar for the swiss (didn't have swiss) and the only thing I would do next time is rehydrate the cranberries a bit before baking as they got kind of burnt .....otherwise it was good! should I cover with tin foil to bake? I think I would for at least half the time. Keep an eye on it.